Stops and prevents leakages in the radiator, cooling and heating system. Will not harm rubber hoses, gaskets or other system components. Is compatible with all antifreezes and coolants, also with OAT coolants (Organic Acid Technology). Is formulated to avoid clogging of radiator waterways and temperature sensors. Enhanced protection against rust and corrosion. For all “water” cooled systems of petrol, diesel and LPG engines when minor leaks are noted. Can also be used as preventive agent. 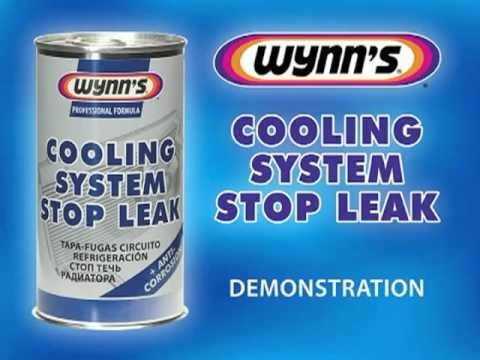 If the cooling system is excessively fouled, it is recommended to clean first with Wynn’s Cooling System Flush. Start engine, bring to operating temperature with all heater controls in HOT position. Shake the can well and pour the total contents into the cooling system via the radiator filler cap or via the expansion tank in case of a completely closed radiator with through-flow system. Close the system and let the engine run for approx. 5 to 10 min. until the leak or leaks are sealed. If necessary top up with cooling liquid. A 325 ml can treats systems with capacity 5 -12 litres.